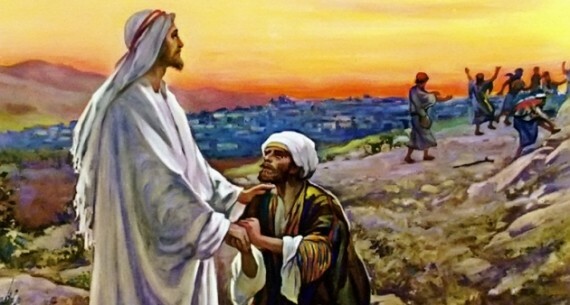 After they are healed, only one comes back to Jesus to thank him. The rest are gone. Here’s what I want you to see. Pay attention to the words of the man and the words of Jesus. 16. He fell to the ground at Jesus’ feet, thanking him for what he had done. 17. Jesus asked, “Didn’t I heal ten men? Where are the other nine? 18. Has no one returned to give glory to God except this one? Now listen to what Jesus is saying: Are you the only one who has come back to give glory to God? Do you see it? Jesus is claiming to be God! Jesus didn’t say: don’t prostrate before me. Jesus didn’t say: don’t thank me, thank God for your healing. Jesus didn’t say: give glory to God alone, not to me. This would have been exactly what a mere prophet, a mere servant, a mere messenger would say. But, here we have Jesus asking why the others did not come back to Him to give glory to God. Jesus is God.